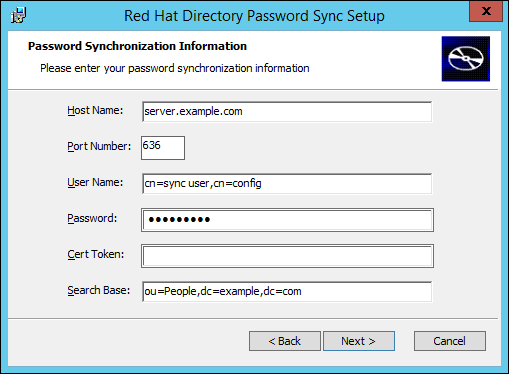 Windows Synchronization is mostly handled by the Directory Server alone, but synchronizing passwords requires a special "hook" that catches password changes and sends them over a secure connection between the Directory Server and Active Directory sync peers. For password synchronization, it is necessary to install the Password Sync Service. Password Sync can be installed on every domain controller in the Active Directory domain in order to synchronize Windows passwords. Passwords can only be synchronized if both the Directory Server and Windows server are running in SSL, the sync agreement is configured over an SSL connection, and certificate databases are configured for Password Sync to access. These steps show how to install the Password Sync Service. Select Red Hat Directory Server from the product list. Select your Directory Server Version and Architecture. After this, a link to download the WinSync Installer is available. This is the Password Sync MSI file. Save the file to the Active Directory machine. There are two WinSync packages available, one for 32-bit Windows servers and one for 64-bit. Make sure to select the appropriate packages for your Windows platform. Double-click the Password Sync MSI file to install it. The Password Sync Setup window appears. Hit Next to begin installing. Fill in the Directory Server host name, secure port number, user name (such as cn=sync manager,cn=config), the certificate token (password), and the search base (for example, ou=People,dc=example,dc=com). Hit Next, then Finish to install Password Sync. Reboot the Windows machine to start Password Sync. The first attempt to synchronize passwords, which happened when the Password Sync application is installed, will always fail because the SSL connection between the Directory Server and Active Directory sync peers. The tools to create the certificate and key databases is installed with the .msi. [a] This log file is not an installed library, but it is created at installation. Configure the Password Sync Service by setting up certificates that Password Sync uses to access the Directory Server over SSL. SSL is required for Password Sync to send passwords to Directory Server. The service will not send the passwords except over SSL to protect the clear text password sent from the Active Director y machine to the Directory Server machine. This means that Password Sync will not work until SSL is configured. > cd "C:\Program Files\Red Hat Directory Password Synchronization"